Update: We just posted our 2017 review of the Top 4 Financial Planning Applications for Advisors including eMoney Advisor, MoneyGuidePro, Navicent and Advizr. As the digital revolution continues to disrupt business models across all verticals, financial planning is one area where technological advancement is key. Wealth managers with more powerful financial planning tools that can create stronger client engagement will have a competitive advantage. Financial advisors are already inundated with endless streams of information and marketing messages. And with so many financial planning software options available, how can they determine which platform is right for their practice? We planned this article late last year, before the recent announcement that Fidelity is buying eMoney Advisor. But our timing is fortuitous. This review should be quite useful for advisors who might be concerned that Fidelity will decide to end support for other custodians or make ‘tweaks’ that are detrimental to their competitors. Founded in 2000, eMoney Advisor is a comprehensive financial planning software application that offers clients both, goals-based and cash-flow-based, analyses and projections. The platform aggregates more than $1 trillion in client assets over more than 875,000 accounts and services bulge-bracket clients, like TD Ameritrade, RBC Wealth Management, New York Life, and LPL Financial. The firm works with 46 of the top 50 broker dealers, whom are capable of absorbing eMoney’s relatively higher cost. 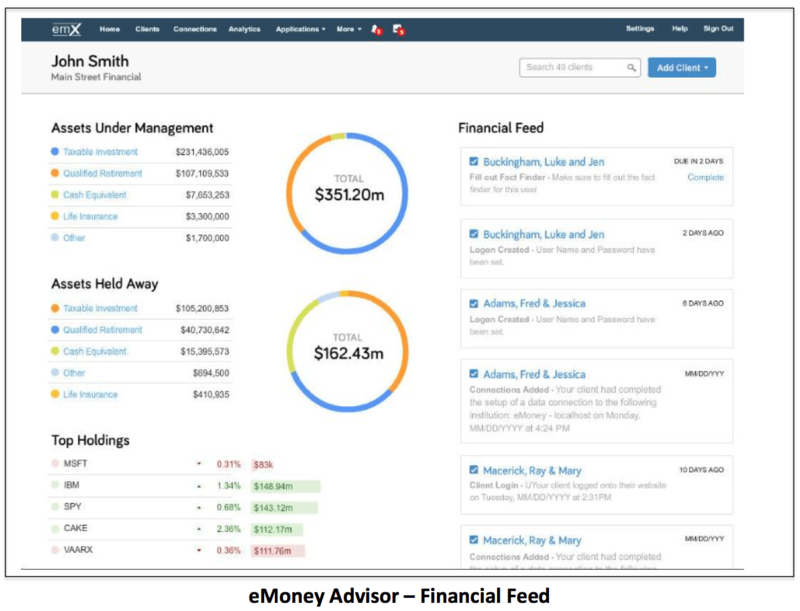 The first thing we noticed on the eMoney advisor homepage was the “Financial Feed” feature on the right-side of the display, offering advisors a Facebook-like user display, which keeps them up-to-date with everything happening in their book of business. This feed provides advisors with real-time and interactive alerts, tasks and news, linked to all of the data stored on the application, which helps them track potentially crucial client-and-market data. The interactive functionality of the alerts allows advisors to click on the alert link for more detailed information about the alert message. Additionally, the feed issues alerts to notify advisors when clients log on to eMoney, or add a new account or upload information to their profile. Also, eMoney is developing a new feature that will integrate financial data from sources like Morningstar into the feed, which will help advisors build client portfolio projections based on market events like, company earning reports, for example. The only downside to this feature is that, like Facebook, the feed might bombard the advisor with redundant and excessive notifications. Meanwhile, in the main interface, the three primary categories highlighted are assets under management (organized by asset class, tax status, etc…), assets held away by other custodians and top movers, which displays the most active holdings in the advisor’s investment portfolio in real-time. The interface design uses color efficiently without overwhelming the end-user. The abundance of clean white space establishes the foundation for a modern and intuitive navigation experience, paring the interface down to its most essential and user-friendly form. Another impressive feature is the platform’s client portal, which allows the advisor’s clients to access the platform or print out a report about their finances whenever they want. The eMoney client portal is a welcoming, detail-rich and interactive asset, which displays all wealth-management-relevant client information, like net worth, investments, insurance, budgets and spending in way that delivers maximal transparency, while minimizing navigation-difficulty for the client. Also, the client portal facilitates the aggregation of held-away assets and accounts, which help advisors get a clearer picture of their clients’ financial lives. All three portals have the same interactive functionality, embedded with a “what if” feature that provides a drop-down list of portfolio-disruptive scenarios, like a bear market, disability of a spouse, retirement, heightened inflation and other events. The platform also enables advisors to combine multiple what-if scenarios in their projections. And for more detailed scenario insights, advisors can access the decision center and choose from three views: cash flow, detailed cash flow or a Monte Carlo analysis that determines the likelihood of a plan’s success along with other data. eMoney’s analytics allows advisors to mine their book by age, institution, account type, managed assets vs. held-away assets, and a host of other offerings. eMoney also offers clients a “techniques” function, which allows them to explore potential actions they can take to fund a goal or meet a cash-flow objective. 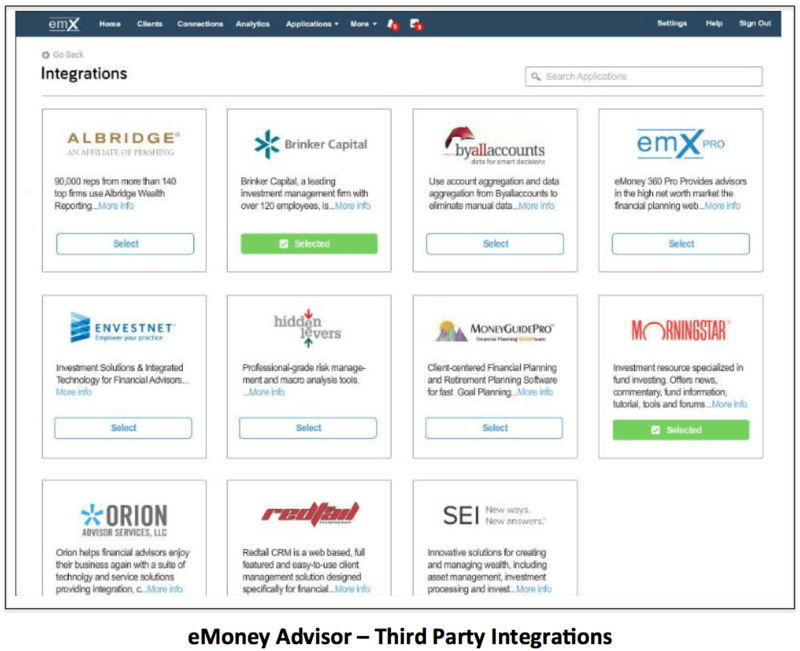 eMoney boasts some highly impressive integrations with CRM leader Redtail, portfolio accounting tool Orion Advisor Services, Allbridge Wealth Reporting, and industry-leading market research tool Morningstar, to name a few. With all of these strategic partner integrations, the advisor’s workload is greatly reduced so he can focus on the real priority: the client. Last, but not least, the eMoney platform also boasts top-of-the-line security architecture. Although, the cloud has been a well-documented haven for cyber attackers, e-Money uses impenetrable 256-bit, Secure-Socket Layer encryption to safeguard client information, and stores all of its data with Sungard Data Systems, the market leader in data storage for major financial firms. At a minimum rate of $3,600 per advisor for the recently upgraded EMXpro package (standard EMX retails for $2,400), the cloud-based service is more expensive than the average financial planning application. But for the right advisor with the right clientele, the subscription amount is well worth the investment. The user experience, intuitiveness and functionality of the platform are seamless, which makes eMoney stand out from the competition. Each financial planning application is graded in the six categories described above on a scale of 1 to 5. eMoney’s strong showing in their Client Portal, Planning, Analytics & Reporting and Security features helped them achieve a total score of 32 out of 35. 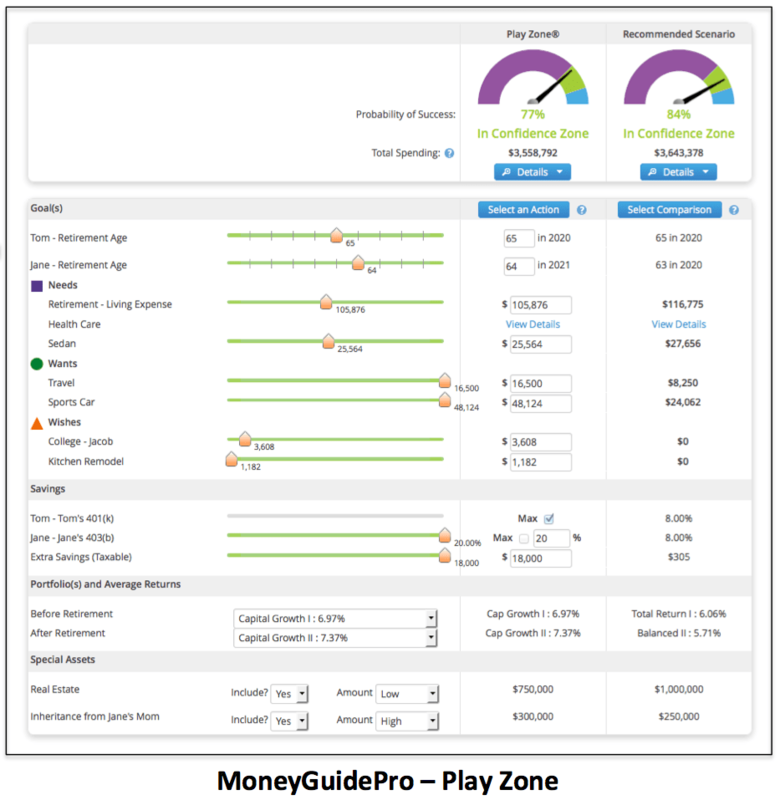 MoneyGuidePro is another dominant player in the financial planning SAAS space. Engineered by financial software company PIETech, MoneyGuidePro was released in 2001 and has been the most-used financial planning platform for the past seven years, according to Financial Planning Magazine’s RIA survey. As of 2013, Aite Group’s research determined that MoneyGuidePro has captured 7% of the financial planning software market in North America. When it comes to financial planning software, PIETech’s mantra is engagement. 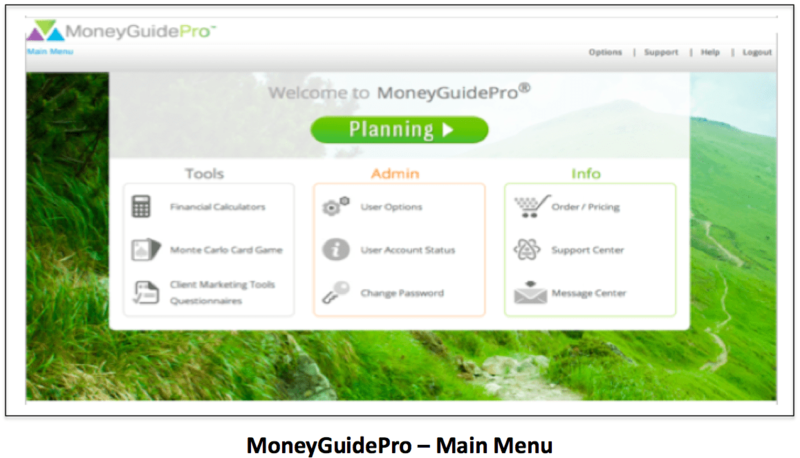 This company philosophy is evident on MoneyGuidePro’s main menu interface with its integration of visually engaging icons that correspond to user options. The Monte Carlo simulator is represented by an Ace of Spades playing card, the change-password setting is accompanied with a key, and so on. The planning tab at the top of the screen easily directs users to the client onboarding portal, which is intuitive and easy-to-navigate. Like eMoney, the platform design consists of abundant white space with conservative allocations of color. But once the planning tab is accessed the platform’s data-input functionality shines. The application has a life expectancy calculator where users can specify variables like, smoker or non-smoker status; their state of health and other detailed data points. From the information provided, the program can then predict the probability of living to various ages. And if the client is married, MoneyGuidePro will calculate the life expectancies of both husband and wife. With MoneyGuidePro’s SMART Portal, the client becomes an active participant in the planning process from the start. While the client is engaged in the process, the advisor maintains ultimate control. Also, the advisor controls the types of modules that the client can see. Also, the platform’s PlayZone tool lets clients adjust assumptions to see how different moves affect their probability of success in a visual and interactive way. The program even allows advisors to model a variable annuity with a living benefit in the framework of a plan to see how their portfolio will react to different market events. Also, the client can also access data detail pages to view items, like year-by-year details of taxes, return on investments, retirement income, and projected expenses. This detail is useful in educating clients about the impact of inflation on the plan goals. The program’s presentation tool is another exceptional feature. After creating a client plan, MoneyGuidePro automatically converts the document into an engaging PowerPoint-style display, which visually engages the client with a host of graphically-rich information and data. The platform also has a feature called Star Track, which allows advisor to save their clients’ plans and compare it with financial projections created in past years. However, Star Track only compares certain metrics, as opposed to the entire plan. The main drawback to MoneyGuidePro’s reporting and analytics functionality is that it doesn’t rely on cash-flow data, which diminishes the accuracy of the projections. However, the lack of cash-flow-intensive analysis may not pose a problem for advisors with lower-net-worth clientele. Integration with third party software and services is an area where MoneyGuidePro stands out from the rest of the field. They list 44 interfaces on their website, which is by far the largest list of any financial planning application. Support is provided for all of the leading products that most advisors are using such as CRM, account aggregation, portfolio management and client portals. Not only do they list all of their partners on their website, but clicking on the corresponding icon brings up a detailed breakdown of which interfaces are supported. This is extremely helpful for an advisor’s IT guys to know what can and can’t be done with each product. Security seems to be another weak point for MoneyGuidePro as the platform is not ISO / IEC 27001:2005 cloud-security certified. The service’s says “websites use Symantec (formerly VeriSign) Secure Site Pro SSL Certificates with a minimum of 128-bit encryption, and, when Subscribers’ web browsers support it, up to 256-bit encryption.” If the majority of data is, in fact, transferred with 128-bit encryption as a safeguard, then that would suggest the data is more vulnerable to attack. 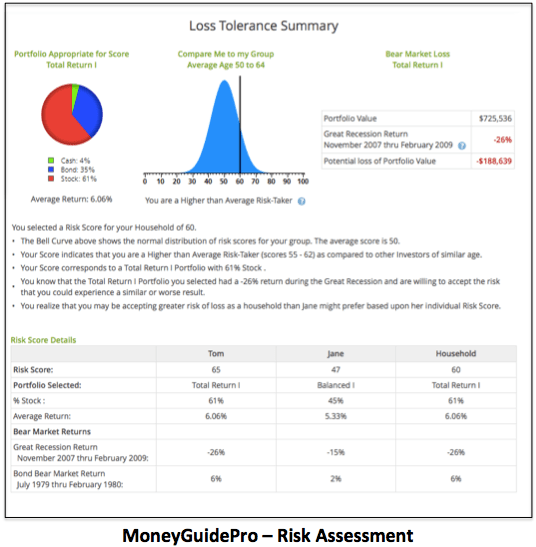 MoneyGuidePro is a goals-based application, which is ideal for advisors servicing clients who are in the accumulation stages of the wealth cycle or have less than $1 million of investable assets. Priced between $1,300 and $2,000, the service is significantly less expensive than eMoney Advisor, and like its competitor, is a cloud-based solution. Each financial planning application is graded in the six categories described above on a scale of 1 to 5. MoneyGuidePro was superior in user Experience and Integrations, but took hits on their Analytics and Security areas, which limited their total score to 31 out of 35. Which is the Best Financial Planning Software? 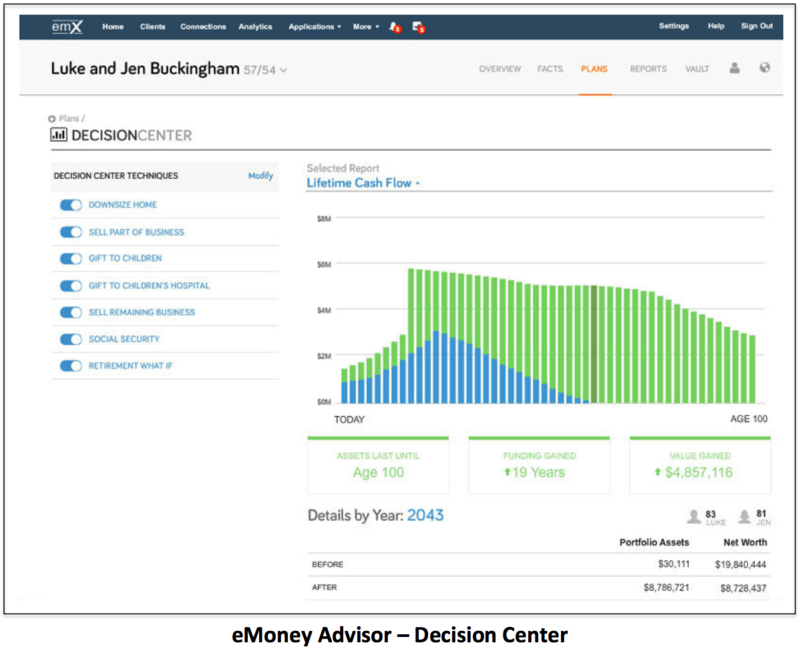 While both applications have compelling benefits and features, eMoney Advisor is a more sophisticated product with its emphasis on cash-flow planning and the ability to model these plans for estate, retirement and education-funding purposes. The software also boasts a superior focus on security, incorporating best-of-breed industry practices and even employing a full-time team of hackers to continually test their security architecture. That’s not to say MoneyGuidePro isn’t a high-performing application, rather, eMoney Advisor is more of a premium product, suitable for advisors with upper-market HNW clientele. 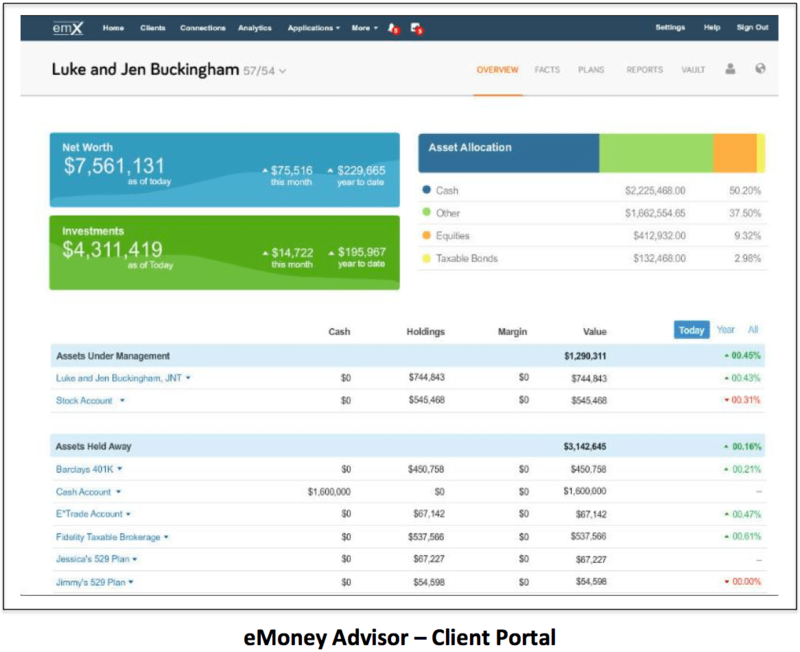 When considering financial planning software for financial advisors, eMoney Advisor is a good solution for upper-level-AUM advisors, but MoneyGuidePro is ideal for the conventional wealth manager. Just a comment on the security portion… my review has found both to be satisfactory in security means, and MoneyGuidePro to be preferable. The two main issues are security certification and encryption levels. Encryption: Both require a minimum of 128-bit encryption, but defaults to 256-bit if the browser supports it. The are only a select few browser versions today that can’t support 256-bit – mostly IE running on Windows XP and some older iPhones running Safari. Even still, 128-bit encryption is by no means weak – if it takes 500 years to break a 128-bit encryption and 1000000000 years with a 256-bit one, does it really matter? In my opinion, this is a moot point until we have quantum computers. 128-bit encryption is still very strong and just because there is a higher encryption level does not mean 128-bit must have vulnerabilities. It is still a high standard for many websites, including governmental ones. Security certification: eMoney is certified ISO / IEC 27001:2005 cloud-security certified, while MGP is SSAE-16 SOC 2 audited/certified. ISO certification is a “snapshot” audit, when verifies that all of the requirements are bet at the time of the audit. A SOC 2 audit happens over a period of time and verifies the facility’s operations consistently meet the requirements. The long term assurance provided by SOC 2 should carry more weight in the evaluation (if you are really wanting to dig this deeply). Thanks for your comment. Not all 128-bit encryptions are created equal. A lot depends on the algorithm used. Some algorithms have shortcut that reduce the time needed to crack them. Also, modern massively parallel computational techniques can reduce the time even more. Other factors that influence the time needed include flaws in the application of the algorithm (i.e. using the wrong encryption mode or short passwords and padding them with some character to the key length). Do you know if eMoney is available in Canada? To the best of my knowledge, eMoney is not available in Canada. Craig,I have looked at both plans and struggle to figure out which one is better for me. MGP has a far superior SS planning tool. It will help identify how client s can maximize SS benefits, which I really like. A difference maker for clients. It appeared to me however that it really wanted to steer me toward a particular portfolio, which may be quite different than the portfolio I have for a client. This is disconcerting to me. Also, it does not seem to be able to take each asset, ie IRA’s, 401K’s, NQ accounts, and make separate projections for each at a different rate of Interest. It seems to want to lump all assets together, not allowing for me to illustrate stopping and starting or modify income from each individual investment or bucket. Am I wrong here? eMoney seems to allow for this type of asset management. It also allows for detailed descriptions of each asset including account numbers. It is a bit more complicated to learn and does not have a robust SS Maximization tool and is at east twice the price for an LPL rep.
Do you think I have summarized this accurately? Yes, you are correct. MGP is more of a general financial planning tool that does almost everything, but doesn’t try to go too deep on any one thing. eMoney has more advanced functionality, especially around trust and portfolio management, but is more expensive, as you have discovered. With software, as with life, there are always trade-offs. Only you can decide which way to go. Just starting to use Emoney as a client. Currently the “Web Print” tab is not working so I cannot print reports. I have multiple questions about assumptions that are/are not covered in the assumption reports. From the client side, there is a steep learning curve and Emoney will not respond to client questions, I have to go through my broker (who is also slowly learning) Emoney. The Emoney help system is very poor and not especially helpful. My opinion, my broker would have been better off spending his (my) money on other things since I feel his/her clients will not have the skill or time to learn how to use Emoney. I have been using emoney for 4 years and there are many things I like about it but sometimes I feel like I own a Tesla but am driving it like a civic. With the Fidelity purchase I have started to look at other options like MGP and think your assessment is right on. When I analyzed how many people were actually using the “Vault” it was only 4! And clients aren’t using it for their daily money management like I had hoped. So considering moving to MGP so I can redeploy some of those monthly fees to marketing. I would love to hear from anyone using MGP and what they think. Please advise if you need a more exact breakdown of eMoney’s Monte Carlo feature. The last time I checked, eMoney did not allow you to enter forward looking capital market assumptions, but instead relied on historical data for Monte Carlo assumptions. This seems to be contrary to “best practices” for anyone using Monte Carlo analysis. Is that still accurate? Thanks for pointing that out! We will look into it and replace that screenshot with the correct page.